Beautiful large Japanese antique scroll painting depicting a scene of Mt. 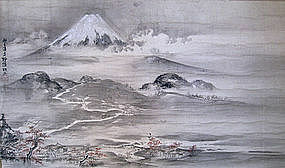 Fuji with clouds and rural village below, leaves of the trees in the foreground are painted in Autumn colors, painted in sumi ink and light colors on paper, silk mounting, ivory ends, Regarding translation of calligraphy on scroll, the language formally states that this painting is respectfully given to a person (Sei in) from another person (Koō yoū ro). It is implied that Koō yoū ro is the artist although it is not stated, Edo Period. Total Size: 76" high x 67" wide Size of painting: 34" high x 58" wide.